Description and first photo for The Big Bang Theory season premiere "The Proposal Proposal"
The Big Bang Theory returns for Season 11 on Monday, Spetember 25, and conveniently, Laurie Metcalf returns as Sheldon’s mother just in time for us to meet her daughter in the same role in flashback on Young Sheldon! 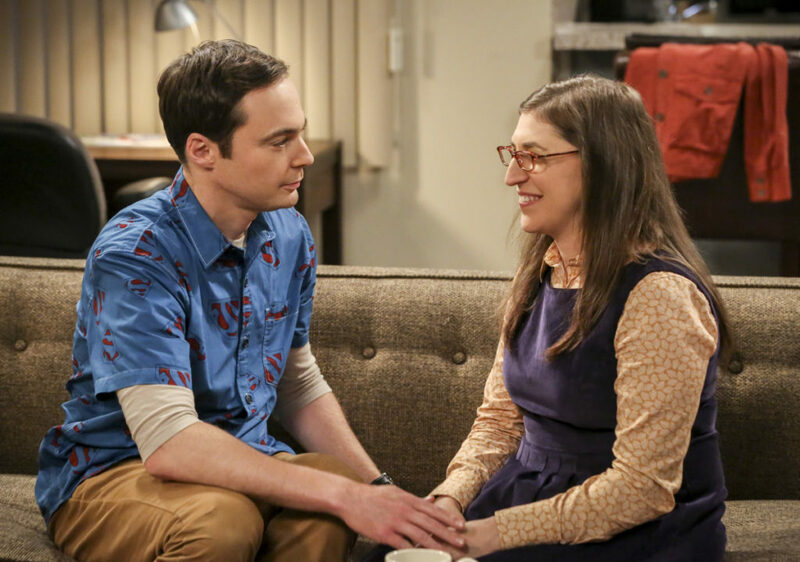 So far, we only have one photo from the episode, which is called “The Proposal Proposal.” In the episode, Amy gives Sheldon an answer to his proposal while Howard and Bernadette struggle with some unexpected news. The Big Bang Theory stars Johnny Galecki (Leonard), Jim Parsons (Sheldon), Kaley Cuoco (Penny), Simon Helberg (Wolowitz), Kunal Nayyar (Koothrappali), Mayim Bialik (Amy), and Melissa Rauch (Bernadette). Recurring cast appearing in the season premiere includes Kevin Sussman (Stuart), Laurie Metcalf (Mary), Riki Lindhome (Ramona), and Stephen Hawking (Himself); the episode also guest stars George Wyner (Dr. Zhang) and Susan Chuang (Dr. Harris).